As iPad and iPhone usage continues to grow in enterprises around the world, are you grappling with how to deploy, inventory, and secure iOS devices in your environment? 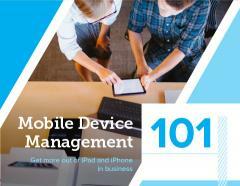 In this e-book, you’ll learn how to manage iPad and iPhone, but also how to leverage these devices for more than just communication. Get the answers you need to get more out of the most trusted platform for IT and business professionals.